« Managing Spain’s small-scale fisheries with limited data? ¡Sí se puede! This week, sharks make their annual summer migration to the Discovery Channel for Shark Week. It’s a great time to learn about some of the advances in shark research happening every day. In just the time since Shark Week 2015, we learned new things about where we can find the world’s largest concentration of sharks, how great white sharks migrate, how sharks use their photon conductive noses to hunt fish, and how catsharks grow brighter the deeper they swim. We’re also discovering new species to add to the growing list of hundreds of different sharks every couple of weeks. Yet, with all these new findings, we still have a lot to learn about these keystones to our ocean ecosystems. Off the East Coast and in the Gulf of Mexico, a large number of shark species swim in and out of U.S. waters. The National Marine Fisheries Service (NMFS) manages these species of sharks—including many known to be highly susceptible to overexploitation such as great whites, whale sharks, and bigeye threshers. In several fisheries, the incidental catch of sharks (also referred to as bycatch) while targeting other fishes like tuna, swordfish, snapper, and grouper remains a significant threat. 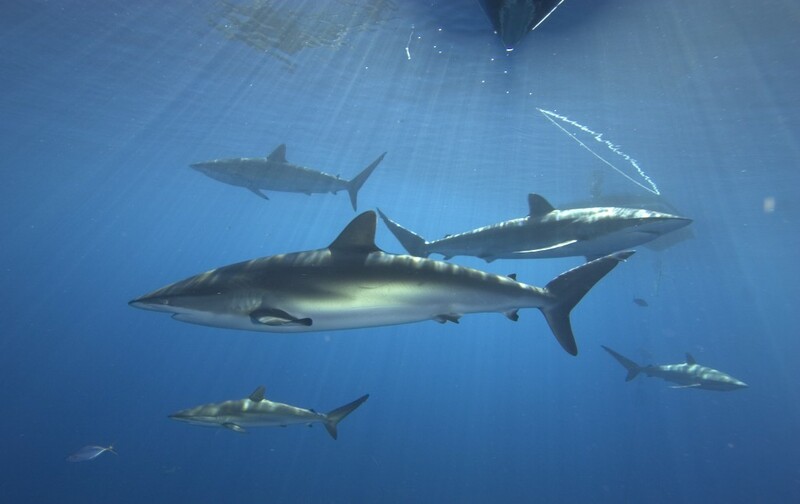 NMFS aims to protect many vulnerable sharks by simply prohibiting landings without actually preventing the overfishing that can result from bycatch. In other words, even though fishermen can’t land these sharks, the sharks can still die as a result of being caught while the fisherman tries to catch another species like tuna. For example, dusky sharks, a large coastal species, have been suffering overfishing for fifteen-plus years despite the ban on bringing them to shore. Not only does this approach not prevent overfishing, it makes it difficult for us to get comprehensive data on “prohibited” species. The ban approach does not require an organized data collection program. Yet collecting and analyzing these data provide the scientific backbone for understanding the health of imperiled shark populations and effective management. Today, regulators collect bycatch data across domestic and international fisheries through a system that makes assessing shark mortality like solving a puzzle. For fishermen targeting other valuable fishes, having sharks on the line wastes time and money. Moreover, fishermen depend on healthy fisheries that result from intact ocean food webs that include sharks. In short, many fishermen would prefer to never catch sharks instead of the tuna and other species they seek. We need a new approach to shark management for these fisheries that helps U.S. fishermen catch more of the species they want while avoiding imperiled species like many sharks. Cooperative management and conservation incentives can lead to a more flexible regulatory structure that allows fishermen to use their expertise to avoid sharks. Leveraging the knowledge of fishermen who are on the water, together with full accountability across the fleet, can be a powerful combination to reduce shark bycatch. Emerging technologies could play a role to effectively monitor and enforce real bycatch limits. We have seen this work in other instances where lowering bycatch was important, like in the West Coast groundfish fishery where smarter management led to a 70% reduction in bycatch. These approaches also lead to better data, and strong science is the foundation of good management. Through carefully tabulating – rather than ignoring – shark catch, scientists and managers can figure out where sharks are being caught and assess the health of shark populations. Fishermen can use that information, in turn, to reduce their unwanted catch of sharks. By developing a flexible system that improves both conservation and fishermen’s profitability, we can protect some of our ocean kingdom’s most compelling creatures. This entry was posted in Domestic and tagged bycatch, shark conservation, shark research, Shark Week, sharks. Bookmark the permalink. Both comments and trackbacks are currently closed.